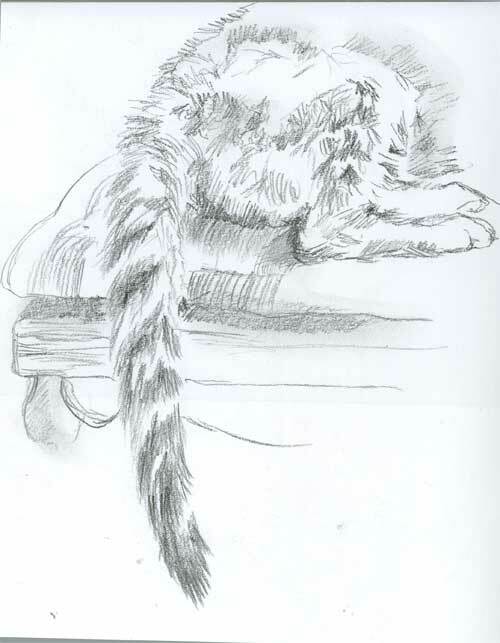 As well as doing portraits, I’ve been doing a series of sketches of Mandu’s features – her tail, her paws, her eyes. More will be posted later. I’m exploring using different media to see which represents the texture the best. The graphite pencil seemed best for the smooth fuzzy tail as well as her scruffy flank. A few additional strokes attempt to describe a corduroy cushion on an old pressed wood oak chair. Northern noonday light was coming in the window to the right. Yes, I am seriously addicted to sketching. 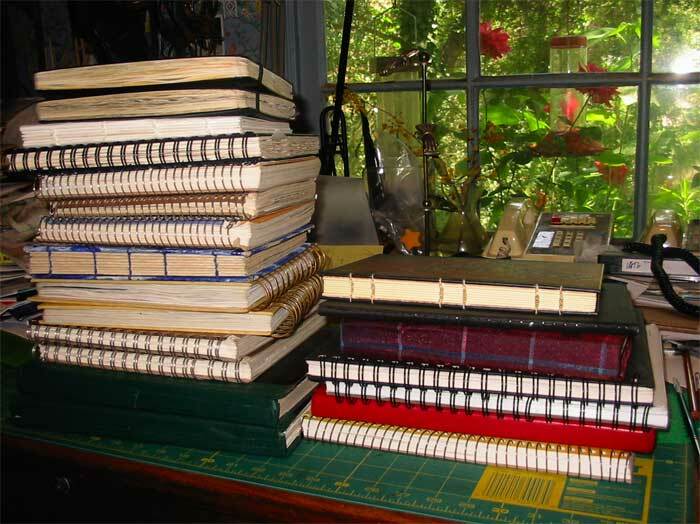 These are the sketchbooks I’ve used since March 03, when I returned to art after a 20 year hiatus and essentially started over from sketch, I mean, scratch. The stack on the left is completed books. The stack on the right is books that are partially full – a little bit or a lot. Every one of these is precious to me for one reason or another. Like any place where practice is done, they are full of false starts, errors, bad perspective, wobbly lines, strange anatomy, half-baked ideas and more. But that’s what my creative journey is all about. The way I figure, the more mistakes I make the better chance I have of doing something right. So I try to make a lot of mistakes every day. The more the better, really. 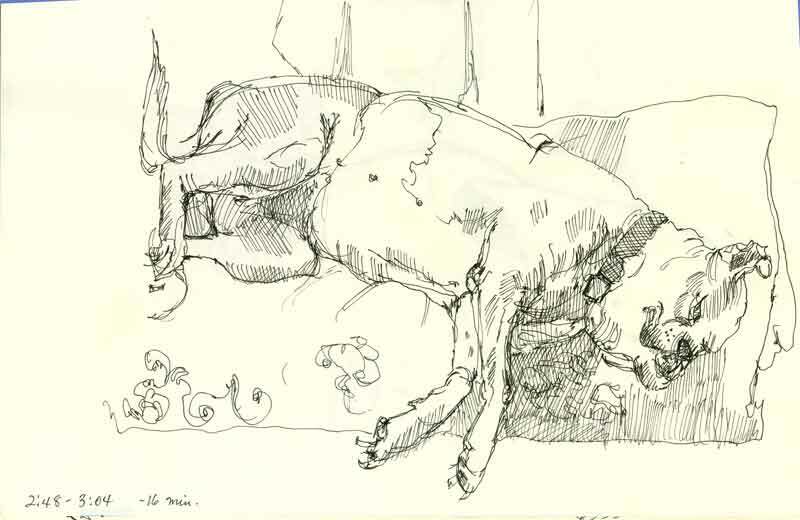 I’ll be posting new Mandu drawings later today if you want to check back. She’s drinking her half and half with enthusiasm again, and that’s a good sign. Yesterday I did a whole series of “cat part” drawings – ears, eyes, tail, etc. But I need time to scan them and it’s midnight now. Thank you everyone for your supportive comments during this emotionally stressful time. Some people might say “get over it, it’s just a cat,” but animal lovers know it’s not that simple at all and that relationships come in all shapes, sizes and species. Feeling your kindness helps ease the impending loss, whether it comes in days, weeks or longer. My husband reads your comments, too, and I know that it means a lot to him as well. 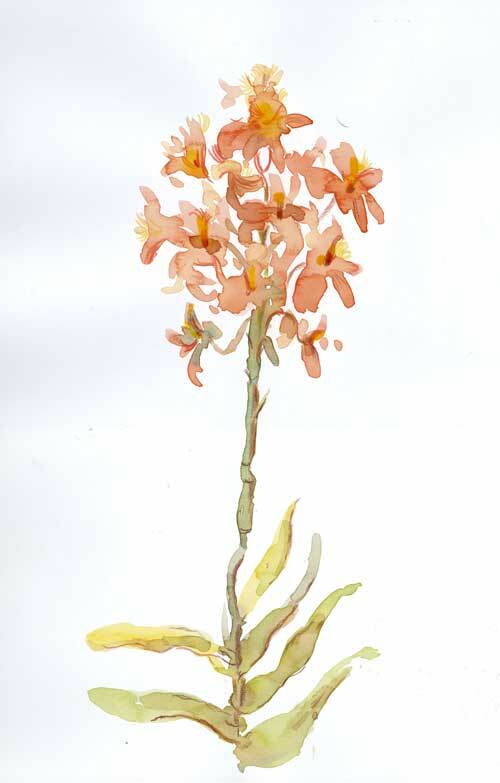 I painted this epidendrum orchid in my back yard recently. The frilled, fringed flowers are commonly orange, yellow, red or cream colored and are borne on long spikes like this (I’ve only shown a part of it – the spike is probably 2 feet tall.) This painting was done in my 9 x 12 sketchbook as a study. I will likely do one on ‘real’ watercolor paper next. I added a little colored pencil for the accent parts. 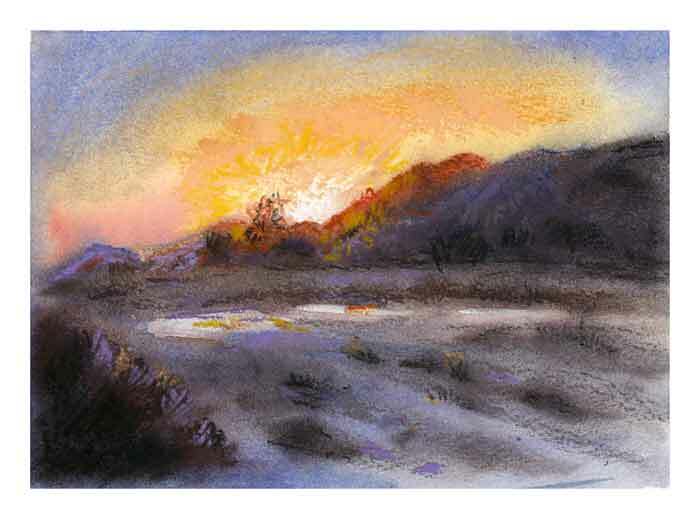 This morning I’m off to paint at Descanso with my friend Robin and I’ve been looking forward to it all week. Mandu is now living in the kitchen, on the floor, where she has a towel and all of her “things” close by. I see her moving from one to another, delicately touching them with her muzzle, to orient herself. We’re thinking that she may have some sense of light and darkness, but it is too soon to tell. At any rate, she does not appear distressed and is eating, drinking and washing her face as usual, although she’s not eating as much as usual and needs to be ‘reminded’ to eat, since she no longer gets the visual stimulus. 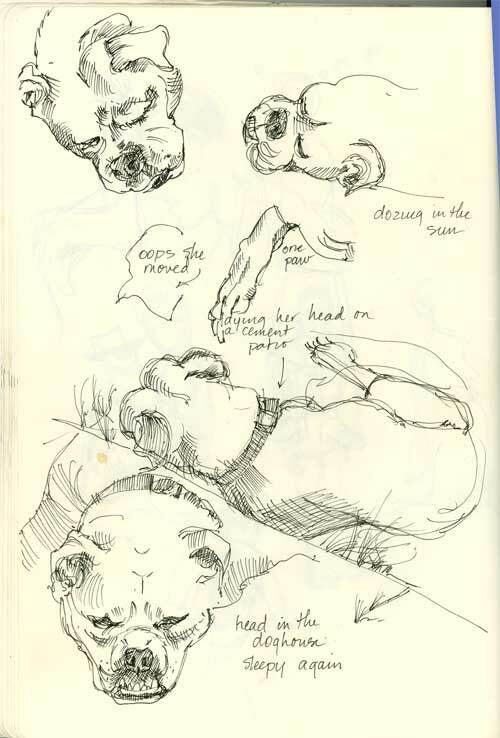 My friend Katherine Tyrell is teaching a wet canvas class in drawing and sketching in public, so it thought it would be fun to participate in some of her assignments and challenges. It sort of takes all the surprise out of it when I come up with my own challenges and it’s nice to let someone else throw a curve for a change. And I know her lessons wil be quite good. One of the first assignments was to do a series of 5, 10 and 15 minute sketches, and to try to do them as quickly as possible to loosen up. I don’t know any model who is looser than Ripley, and she obliged me with a few sittings, er, lyings. I’ll have to pay off in Milk Bones later. No more than 15 minutes from our home, there’s a canyon that opens out into a wide wash. Part of it has been reclaimed as a beautiful golf course, but other parts of it remain as wild as ever, strewn with boulders and sprouted with sagebrush. We were driving near there yesterday, just at sunset and I was captivated by the colors. Only a trace of water remained after the spring rains – and those tiny puddles caught the light of the sun. Even in the most ordinary urban and suburban areas, there is extraordinary beauty if we look in the right direction at just the right moment.